Home Tags Posts tagged with "hyperdocs"
It’s that time of year again. The holiday season is here and soon 2018 will be upon us. However, before we jump ahead to 2018, let’s review some of the great Microsoft resources from 2017 on our blog that you might have missed. From Photos to Minecraft to OneDrive and all of the tools in between, these are resource-rich posts that you simply must read! Below, you will find a roundup of 2017 blog posts relevant to Microsoft divided into several categories. Windows 10 Fall Creators Update: Moviemaker Lives: Learn how the Windows 10 Fall Creators Update can help your students better tell their stories in the classroom and beyond. Story Remix TCEA reported on earlier this year: Still miss Moviemaker on your Windows computer? Let it go and embrace Windows Story Remix, which takes cross-platform movie design to another level! Animated GIFs: Education in Motion: Creating animated GIFs is a good way for students to summarize learning and have fun at the same time. Learn about some great tools, including Microsoft OneNote, to use. Transform Learning with Text to Speech: Technology today provides a multitude of solutions for turning text to speech and vice versa, regardless of the device being used. Creating Six-Word Memoirs: Student creation of six-word memoirs can help form powerful connections to learning. Discover some technology resources to help them. HyperNotes? Use HyperDocs with MS Office 365: Take Hyperdocs to the next level by creating hypernotes with MS Office 365 or OneNote and ensure that students have access to the information they need. Checklists: Scaffolding Metacognitive Awareness: Available on all devices, Microsoft OneNote brings a host of features to the table. In addition to all the features that Google Keep has (albeit with no reminders feature or grab image text in the free OneNote version), OneNote has many more. Recently, it underwent a radical simplification from OneNote 2016 to the free OneNote app. Creative Commons: Make OER Copyright Simple: Open Educational Resources and Creative Commons licensing have truly opened up the world of publishing and free resources for students and their teachers. Microsoft Onenote can be one of the digital textbook creation tools you and your students use. Podcasting with Microsoft Sway: Podcasting is an amazing way for students to showcase their learning. Use Microsoft Sway and you have a final product that is beautiful and easy to do. Enhancing Parental Access with OneNote Class Notebook: Microsoft listens to teachers and adds three new features. One of the notable features includes enhanced parent access to student work in OneNote. Multimedia ELL Assessments: Using technology for multimedia assessment makes sense. And with OneNote, teachers can easily make Anecdotal Records Assessments for ELL students. Visualizing Our Understanding with Graphic Organizers: Visualizing our learning is a powerful way to ensure retention of what has been learned, and graphic organizers make that happen. Five Steps to Game-based Learning with Minecraft: If you want to effectively begin using game-based learning with your students and ensure engagement, there’s no better way to start than with Minecraft. Minecraftian Strategies with Marzano: New trends in educational technology can easily work with the research from Marzano on classroom instruction that works and Minecraft: Education Edition. Fantastic Voyage-Minecraft Lesson Planning: Add project-based learning components to these Minecraft lesson plans and see learning and engagement soar in your classroom. Virtual Space Construction Workers: If you are an eligible school district, learn how to get Minecraft: Education Edition FREE for one year with a new Windows 10 device. Creating Worlds of Tomorrow: Wish you had a digital assistant to help you build a virtual world? Now you do. Minecraft: Education Edition (also known as MCEE and in use in 100 countries) now has a mod known as Code Builder, which makes building and creating in the online virtual world as easy as drag and drop. Designing Minecraft Spaces: Encouraging students to design Minecraft spaces allows them to ponder the possibilities of changing their physical world as well. Seven Keys to Blended Learning: If you’re dipping a toe into the blended learning waters, here are some great ideas to take with you as you help students master core content. Engaging Learners with Microsoft Forms: Dump those old paper rubrics and flip the learning! Empower yourself and your students to use Microsoft Forms for the quick evaluation of academic work. This makes grading easy and simplifies the process for students. Let’s explore some ideas for using Microsoft Forms, as well as review Forms features, in the classroom and/or for professional learning. Windows Tips & Tricks: Want to make your Windows 10 device faster, safer, and smarter? These five tips with assorted tricks will get you started and moving in the right direction. Five OneDrive Tips You Can’t Live Without: Looking for ways to increase your productivity and save time? These five tips for OneDrive, a free resource, can help. Use OneDrive to Back Up Your iOS Camera: Need to backup your iOS photos and videos? Consider using OneDrive as an easy way to store, interact with, and share your camera roll. Get Organized-Productivity Tips for Onenote: Need help organizing the vast mounds of paperwork generated by your campus? Try using OneNote and the chore becomes a breeze. New PowerPoint Translator Makes Captioning Possible: Accessible learning becomes a reality with Microsoft’s newest offering. See how making same language subtitles make learning accessible. No More Death by Powerpoint: PowerPoint doesn’t have to mean a boring presentation. Learn some new ways to keep your audience engaged and even moved during your presentations. More Free Powerpoint Templates: Find the perfect template to ensure that your presentation is a powerful story that resonates with your audience and achieves your desired goals. Digitizing Paper: In this blog, learn about four powerful tools for iOS to use when you’re ready to digitize the papers in your classroom or office. Office Lens became my new favorite free app, not only because you can scan to a variety of online spaces, but because it now includes immersive reader. Farewells, Docs.com, Hello Enhanced Onenote, Forms and Flows: Learn about the latest Microsoft updates to OneNote, Forms, and Flow and the ending of Docs.com in this must-read blog for MS fans. Get Current on Tech Learning: Need to update your college learning? Avoid paying expensive college course fees. In this TCEA Responds, we explore how to make lifelong learning possible, including the Microsoft Education Community. Gamifying OneNote Learning: Take your professional learning to a new and fun-filled level with this game board on OneNote. Gamification makes it easy to master new skills! As we move into 2018, don’t forget to stay tuned to more fabulous posts on our 2017 EdTech’s Must-Read K-12 IT Blog! In addition, be sure to join our email list to ensure the hottest new content gets delivered right to your inbox. The time has come again for us to share our great Google resources from 2017 that you might have missed on our blog. We have many remarkable posts on topics such as Chrome tips and tricks, HyperDocs in the classroom, and free Slide templates. The Power of Add-Ons: Save as Doc – Manage Form responses with the Save as Doc add-on. Transform Your Classroom into a Game Show – Gamify your classroom with this great add-on. TCEA Responds: Connect with Google Certified Administrators – Connect and collaborate with other Certified Administrators through the online communities mentioned in this post. Getting Serious with Android (Part 1) – Take your Android skills to the next level by exploring developer blogs and newsletters. Getting Serious with Android (Part 2) – Discover useful forums and YouTube playlists that will help you as you create your first Android app and enter the wonderful world of coding. Getting Serious with Android (Part 3) – Add to your Android-developer bag of tricks by taking advantage of these podcasts and Google+ communities. TCEA Responds: Podcasting Resources – Capture audio with these Android apps. TCEA Responds: Recording Speakers – Record and edit a speaker’s voice with this Android app. 10 Chrome-ifying Tips and Tricks – Power up your Chrome browser usage with these tips and tricks that require no extensions or add-ons. Animated GIFs: Education in Motion – Create an animated gif using this fantastic extension on your Chrome browser. Beautify and Protect Your Virtual Home: Google Chrome Browser – Discover some new Chrome add-ons that will beautify your screen, help you be more productive, and protect your privacy while online. Enhance Accessibility with Chromebooks – Explore a few accessibility apps and extensions for Chromebooks. New Chromebook Features – Explore new Chromebooks available for education that will make it easier to take advantage of classroom learning opportunities. Math Tools for Chrome – Examine powerful math tools that your students (and you!) can use with the Chrome browser. Two New Features in Google Classroom – Individualize learning for both students and adults with these two new features in Classroom. Differentiation with Google Digital Task Cards – Explore ways of creating digital task cards using Slides and Drawing in order to differentiate learning in your classroom. Google Lets Me Finally Be an Artist! – Check out the Auto Draw program and how it can help students in the classroom. Quick, Draw! with Google – Discover how Quick, Draw! can be used with your English Language Learners. Explore Google Earth’s Brown Bear Livecams – Incorporate livecams in the classroom by exploring Earth’s Brown Bear Livecams. Forms Smackdown: Google vs Microsoft – See how Forms stacks up to Microsoft Forms and discover features of each. Give Thanks with Google Forms – Pick up ideas on how to use Forms for Thanksgiving classroom activities. Managing All of Your Email – Organize and sort your emails with these mobile device apps and organizers. Provide Custom Email Updates for Parent Communication – Provide personalized parent communication using Gmail in three easy ways. Free G Suite Curriculum – Teach digital literacy skills to students with the new and free curriculum from Google. Empower Learners with the 5E Model and Hyperdocs – Mix in HyperDocs with the 5E Model in order to engage and empower new learning in your hyper-connected classroom. HyperDocs in Elementary – Organize content for student learning, collaboration, and creation in your elementary classroom with HyperDocs. Research Tools for Young Learners – Help students hone their thinking and reasoning skills with this wonderful HyperDoc. TCEA Podcast: HyperDrawings with Joli Boucher – Empower students to develop a variety of skills with HyperDrawing activities. Checklists: Scaffolding Metacognitive Awareness – Help students develop awareness of their thinking processes and keep track of tasks with the checklist feature in Keep. Digital Bulletin Board Smackdown – Learn how Keep compares to other digital bulletin boards. Researching and Sharing with Google Tools – Ensure that student research is valid with these two free Google tools. Creative Commons: Make OER Copyright Simple – Get insight about Creative Commons copyright licenses and how to create or remix content found when searching. Fact Check Now Available in Google – Discover how you can “certify” that news returned from a search has (or has not) been checked for accuracy and truth. Keeping Your Google Account Safe and Uncluttered – Keep your account safe and free from unneeded authorizations with this simple procedure. A New Type of Writing Prompt – Encourage students to write with this emoji writing prompt generator. Easily Analyzing Student Data with Google Explore – Easily decipher data with Explore. TCEA Responds: New Google Sites ePortfolios – Explore the pros and cons of Sites as a digital portfolio solution. Engage Students with Google Slides Q&A – Actively engage students in the classroom by utilizing the Slides Q&A feature. Fabulous Presentations with Google Slides – Create moving and engaging Slides presentations in order to get your message across. Makin’ It Merry – Celebrate the holiday season with animated gifs in Slides. Slide into the New Year with Student eBooks – Allow students to create eBooks using Slides. Free Templates for PowerPoint/Google Slides – Download gorgeous, free templates for Slides in order to beautify your slide presentations. More Free Presentation Templates – Find the perfect template that can be used with Slides in order to ensure that your presentation is a powerful story that resonates with your audience and achieves your desired goals. Twitter Takeaways: Five Google Tips – Learn tips on how to use Twitter to discover great resources. Three Tips for Google Suites Updates – Stay current with updates and new possibilities for Google Suites for Education with these great resources, webinars, and videos. Take Storytelling to New Heights with This Free App – Have students showcase their brilliance and creativity with this amazing free storytelling tool. The Latest Google Update – Check out a number of very nice updates that G Suite has added to their products. Three Tips for Google Suites Updates – Stay current with updates and new possibilities G Suite for Education with these great resources, webinars, and videos. Five Tools for Creating Global Perspective in the Classroom – Help expand students global perspective and connect them to the real world with these tools. Transform Learning with Text to Speech – Use the built in text-to-speech capabilities in Docs and Keep with students in the classroom. As we move into 2018, don’t forget to stay tuned to more fabulous posts on our 2017 EdTech’s Must-Read K-12 IT Blog! You can even join our email list to ensure the hottest new content gets delivered to your inbox. In addition, remember the 2016 Resource Roundup blog post offers even more phenomenal blog posts. Have you heard of Hyperdocs? Created by Lisa Highfill, Kelly Hilton, and Sarah Landis, Hyperdocs take advantage of the read/write aspect of Google Suites. These digital documents are intended to engage and live online, providing students with self-paced, often collaborative, scaffolded learning opportunities. Lisa, Kelly, and Sarah share their insights in their book, The HyperDoc Handbook. The term “remixing” describes altering the original state of a creative work. Teaching technologies like Google Suites for Education, Microsoft OneNote, and Class Notebook make it easier accomplish this in the classroom. Teachers, often exhorting their own students to juxtapose past ideas with fresh ideas in their assignments, lack experience in doing this with digital tools. Hyperdocs provide the impetus for such teachers keen on remixing their work for media-savvy students. Remixing serves as an invitation to create. 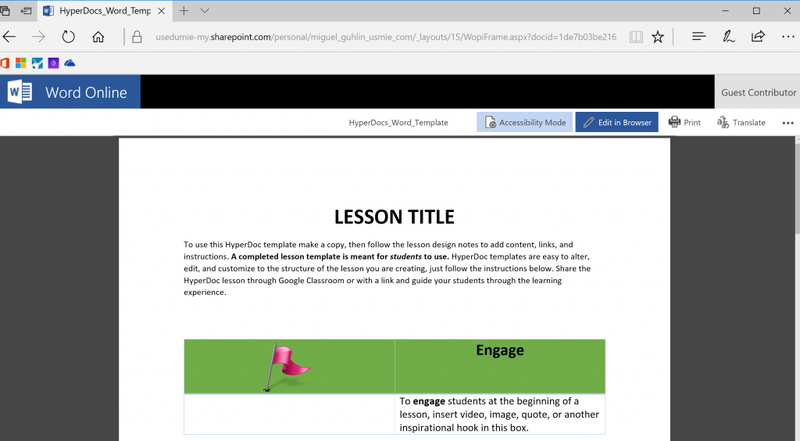 One educator has responded to the invitation to remix in a creative way, deviating from the standard templates provided for Hyperdocs. Her name is Joli Boucher (@joliboucher). 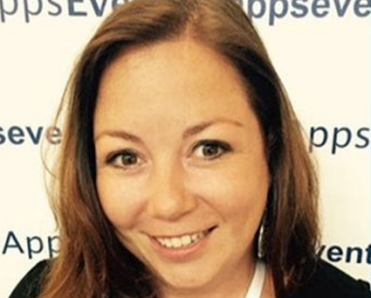 You can read her writing at The FlippedTech Coaching. In the early summer of 2017, Joli and I had a short conversation about her innovative adaptation. This conversation, edited to seven minutes of insight, will provide you with more information about hyperdrawings. You can add the directions and assignments in the blank space next to the canvas. The canvas is an amazing area for students and teachers to demonstrate understanding, solve problems, create screencasts, and use virtual manipulatives. You can easily add Bitmoji stickers (use the Bitmoji Chrome add-on) and clipart by dragging them into the blank space next to the canvas. Ms. Boucher goes on to share that hyperdrawing activities can empower students to develop a variety of skills. These form the framework for each hyperdrawing. Ready to give it a try? Be sure to watch the video tutorials that Joli has embedded in this blog entry, HyperDrawings: Creating Amazing Flipped and Blended Learning Activities. Joli provides some great templates for hyperdrawings at the link above. Get a slightly-modified hyperdrawing template that includes a space to place TEKS and/or ELPS. For those who would like to follow a step-by-step approach and contribute, I invite you to use this brief website online. Share your hyperdrawing creation in the TCEA Idea Space padlet, which features Hyperdocs and MMTSs created (or adapted) by TCEA workshop participants. Are you ready to get hyper about Microsoft Onenote Hyperdocs (a.k.a. “hypernotes”). HyperDocs.co tap into a student’s sense of independence and fascination with multimedia. They empower students to create content and easily share it with their teachers and others. However, Hyperdocs and multimedia text sets (MMTS) work primarily with Google Suites for Education. But there’s little reason you cannot adapt Hyperdocs in Google Docs to work in OneNote or Word Online. Copying and pasting from a Google Doc to a OneNote page is straightforward. 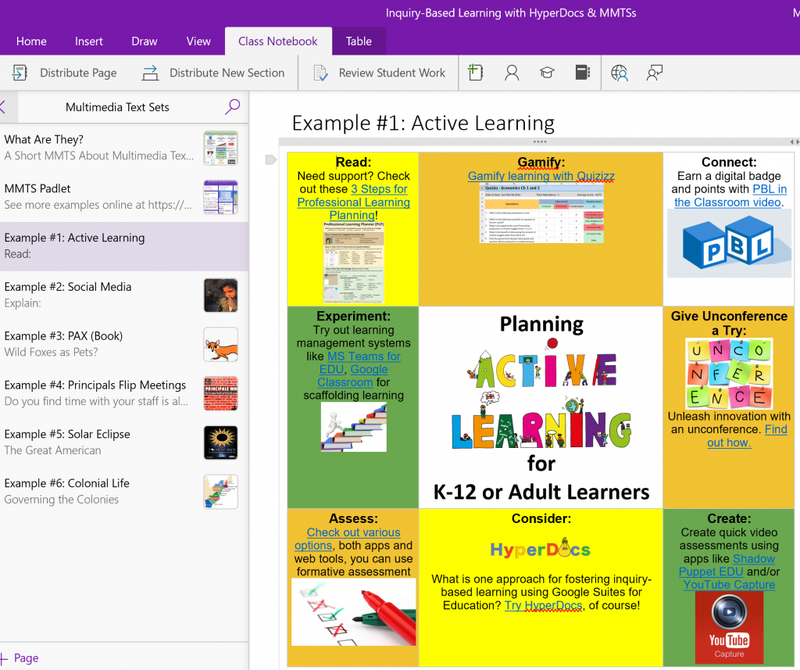 Imagine how easy it is, though, to use OneNote Class Notebook to easily distribute a Hyperdoc activity to your class. While moving Hyperdocs and MMTS into OneNote, I took advantage of new OneNote features announced in August 2017. You can double-check which version (look for version 17.8471.5772) you have by going to your OneNote app settings. Insert online pictures: Use Bing’s Image Search to safely insert photos and images without ever having to leave OneNote. Tables of all shapes and sizes: One cell or many? Choose the number of rows and columns you need to organize your content. Once you’ve got a table, you can add or delete rows or columns, add table shading, or sort your content. What’s more, you are able to embed tables inside of tables. 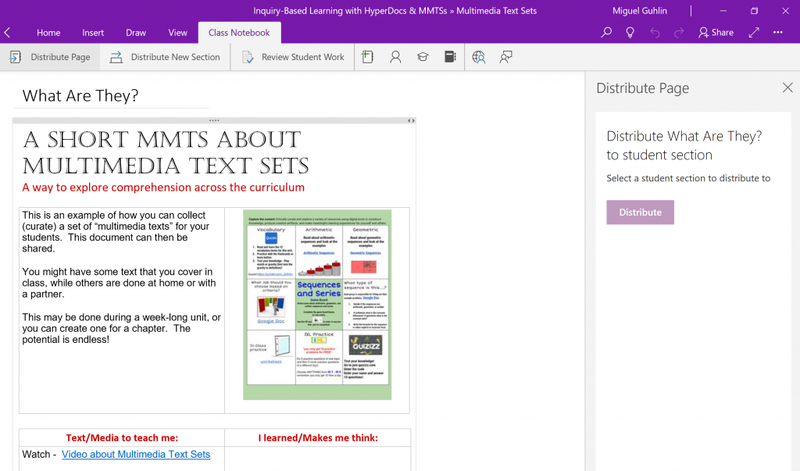 Given OneNote Class Notebook’s ability to easily distribute content, you can now create a Hyperdoc and then send it to students. Or students can copy the content out of the OneNote Content Library into a Class Notebook. If you prefer to work with Word Online files, you can also copy-and-paste Hyperdocs into a Word Online file. Although Word Online lacks a “Make a copy” of the current document on the screen, you can share the View/Edit link. Students with Word Online can access the template using the “Anyone with the View/Edit link.” At that point, they can select all and copy-and-paste into their own Word Online file. However, this is a slightly cumbersome way to share the file. Another approach involves placing a copy in Microsoft Teams OneDrive space. Students can also open the file in their Word Online and save it into their own OneDrive. If you’re ready to hack your classroom, there is no better way than using Hyperdocs and multimedia text sets. Learn more about hyperdocs online at Hyperdocs.co and then start creating your own hypernotes. Want to gear your lesson planning towards student learning? Focus on active learning and increasing what some describe as learner agency. The 5E lesson planning model can help students develop independent thinking. Let’s explore why that’s important. Learner agency is about moving students from passively responding to acting with purpose to reach a desired goal or outcome. Many of students’ learning experiences are passive responses to our efforts as teachers. In a recent workshop for K-12 educators, I found myself grateful for having developed self-paced, “center-driven” learning opportunities. Please allow me to share a reflection on the experience before we jump into 5E lesson planning. While introducing teachers to hyperdocs (learn more here), their expectation was for a sit-and-get experience. When I transitioned participants into an activity after a brief relationship building exercise, one participant shared her discomfort. “I was expecting more of you talking, not me doing an activity that made me think!” As that participant dug into the activity, her creativity started to flow. Later, participants took to the front of the room to share their successful creations. This deliberate abandonment of the stage mirrored the instructional approach I hoped they would adopt: less lecture and passive learning, more active, independent, or small group learning. As questions arose, just as in a writing workshop, I moved my chair around the room. This made side-by-side learning chats possible. Some participants intuited a deeper grasp of a key concept. For those, I would ask them to help another. This facilitated peer-to-peer learning and a reliance on helping our community members. These colleagues would remain longer than I, who was visiting for only a short time. Real learning happens at a student’s own pace. Just-in-time learning conversations make better sense when learners are active and self-driven. How do you scaffold this kind of learning opportunity in your classroom? The chart above points to some approaches. We need to create a system that scaffolds teachers’ instructional design. This design must be embedded in contextual learning, well-resourced, and aligned to the needs of learners. The 5E lesson plan provides one such approach. Hyperdocs, which have caught fire via the Twitter hashtag #hyperdocs, combines the 5E model with the flexibility of Google Docs. 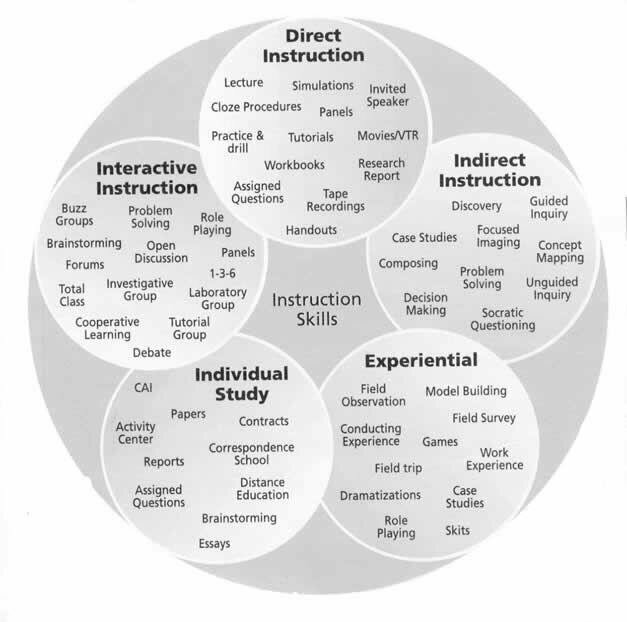 Learner agency and active learning are built in, both prerequisites for this instructional approach. Let’s explore some of the design tips. Know what the purpose of any recipe, any formula, or checklist is? The purpose of a checklist is to ensure we apply knowledge in a consistent and correct manner. This helps us avoid the pitfalls of not knowing enough about what works and being unable to properly apply what we know to a fresh situation (source). 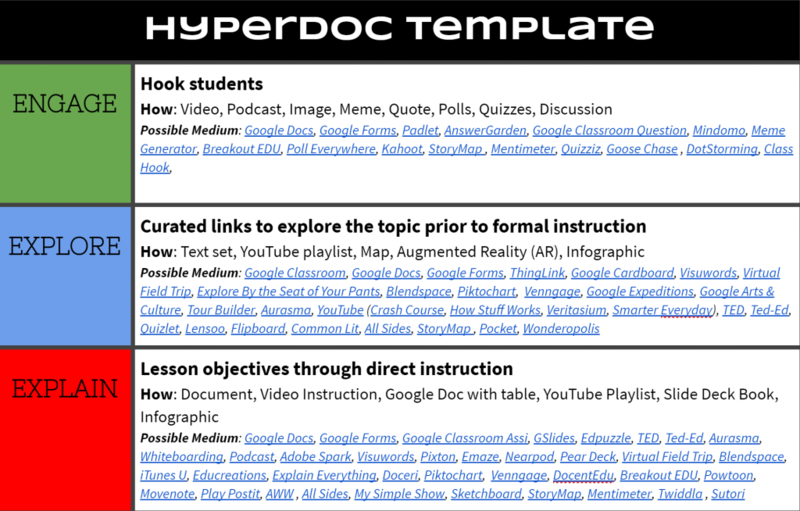 Even though you may not know enough about all the possible technologies, consider how this Hyperdoc template scaffolds your lesson planning development. Do you see how it combines elements of the 5E model with technology, making it easier for you to craft engaging, active learning opportunities for your students? The 5E Model is essentially a checklist teachers can follow, no matter what you call each of the steps (e.g. extend or apply). While a traditional 5E lesson may be about engaging students in a problem they can work through on their own, it’s important to create layers of learning. “Variety and contrast drive long-term retention,” says one UCLA cited study in Psychology Today. The phrase “layers of learning” refers to creating a mix of experiences. Students, K-12 or adult learners, need a variety of contrasting ideas and resources. This layered approach speeds learning and reflects how human brains work. Learning happens in a gradual manner over time. To create layers of learning, avoid monolithic blocking of content to master. Break it up. Mix in a variety of content about a topic, as well as about tangential topics, methods, and techniques. One easy way to do this relies on what Lisa Highfill (co-creator of Hyperdocs) refers to as MultiMedia Text Sets (MMTSs). “MMTSs are just docs with links meant to build schema through exploration,” says Lisa. Schema construction, essential according to researcher Frank Smith (Understanding Reading), helps humans with spatial organization linked to time. Learning experiences we craft for others must mix in a variety of experiences over time and space. These help us situate new learning (information and ideas) in our personal timeline reflected in our own schema. “Reflective learning involves conscious thinking by examining or absorbing an issue which triggers a past experience and helps to gain fresh insights into a new knowledge or skill,” says Vandana Kaveti. Given that human beings build theories of the world, constructing scenes situated in time and space, to make sense of new information, reflection can yield fresh insights. Those insights flow from the juxtaposition of old knowledge and the contrast with the new. Returning to Jen Giffen’s Hyperdocs template, there are a variety of technologies to enhance reflection. Reflection can yield insights for individual students. When the opportunity for reflection is extended to a classroom learning community, insights are deepened and increased. To make sure that your hyperdocs will do what you’ve designed them to do, use this handy evaluation check list. We all want things a certain way. This is a natural part of being human. Less a whim, our brains have a schema for each situation. New ideas, information, and experiences challenge us. We must brave discomfort and accept it as natural in order to learn. How well we combine new information with old determines our success. These three tips, combined with previous suggestions, can assist students as they catch fire about learning. This blog was updated with additional resources on October 18, 2017.